Van Aanholt didn't impress many despite his rapid running down the wings. What he did offer was a single, breathtaking goal to open his senior account against Burnley in what was one of the more impressive performances from the Chelsea loanee. Whether or not he will return to the East Midlands next season remains in doubt, particularly should Sven Goran Eriksson's deal with Tsebo Masilela go ahead. Vitor opened his Football League account badly, being sent off in the 6-1 drubbing by Portsmouth at Fratton Park, returning to the first team in November with a goal against Barnsley only to pull his hamstring against Ipswich before Christmas. Vitor impressed when he returned after the festive period, his commanding defensive presence belying his tender years. He would be a popular addition to the squad next year. Joining compatriot van Aanholt from Chelsea on a deal that apparently meant he had to be included in the starting eleven, Bruma made a number of shocking defensive decisions that saw him make seven starts, all of which were in the losing team. In an apparent managerial master stroke, Eriksson moved Bruma into a holding midfield role that immediately paid-off: Bruma netted two thunderous 30-yard strikes against Watford. he is now on an extended loan at Hamburger SV. In what became the loan deal of the Championship, Naughton impressed immediately he moved to Leicester in October, making his début against Hull before scoring in only his second appearance. The England under-21 right back had a season that impressed many, scoring five times in his 35 appearances in royal blue and winning the club's Young Player of the Year award before being named as right-back in the Championship Team of the Year. Naughton would prove an incredibly popular signing either on loan or on a permanent basis, should Spurs' valuation of the promising young player not deter Eriksson from making a bid. A signing that split the opinions of many fans, Yakubu nonetheless did what he was bought-in to do and scored an impressive - and important - eleven goals in his 20 Foxes' appearances. Critics of his 'lazy' style make their voices heard above others, but the Yak's impressive statistics - including a hat-trick against his former club, Middlesbrough - speak for themselves. He is unlikely to return to the Walkers Stadium as his wage demands are believed to be excessive. Another Premier League youngster who impressed in defence was Mee, who carved a name for himself at left-back as well as his preferred berth at centre-half. Arriving in January, Mee's début was not one that credited his true potential and he immediately built upon that poor performance with more impressive appearances later in the month. Now back at Manchester City, Mee would make himself very popular with a return to Leicester next season. Kamara arrived late in the season to provide quality support for Yakubu and he impressed with his style and flair, scoring twice in his seven Foxes' appearances. Now a free agent having left Craven Cottage, he has not be spoken of in the local press and, it seems, he will not be wearing royal blue next season. Ikeme made four appearances for Leicester having signed as an emergency loanee as cover for the injured Chris Weale. Failing to impress, he departed after the arrival of Chris Kirkland and now warms the Wolves' bench. Davies moved amidst some excitement from Aston Villa and immediately impressed with solid defensive performances. Making few mistakes, he extended his stay to January and looked set to sign a permanent deal, only to snub the Foxes and join Birmingham City for Premier League football. That ended well. Immediately popular, Cunningham's work ethic made him a firm favourite after he joined the club in October. He made twelve impressive appearances before a reckless challenge from Hull City's Liam Rosenior on New Years' Day broke the leg of the young defender, who is now fully recovered and enjoying pre-season with his parent club. Unlike Yakubu and his similarly 'lazy' style of play, Bednar failed to deliver the goods during his two months at the Walkers Stadium. Arriving in November to some criticism, Bednar made just five appearances before quietly returning to West Bromwich Albion at the start of January. A dream move for the boy who grew up in Barwell, Kirkland indeed made his boyhood dreams come true when he walked out at Portman Road to play for the Foxes against Ipswich in December. Unfortunately his dreams ended that day as he let-in three goals and he returned to Wigan after making just three appearances due to his recurring back injury. Uchechi was never given a squad number and consequently made no appearances for Leicester, despite scoring in a January behind-closed-doors friendly against the San Jose Earthquakes. He's now training for pre-season with Aberdeen. 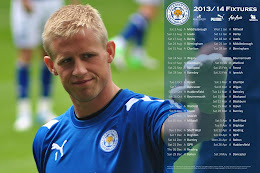 The likeable Dutchman made just four appearances for the Foxes despite signing a three-year deal with Paulo Sousa at the start of the season. Released having not made a single appearance under Eriksson, he is now preparing for the new season in Poland with Wisla Krakow. Having trained with the squad it was only natural that the former Portugal international be added to the playing roster. What was not known at that time was that he would usurp Chris Weale's position as Number One, destroy the Bristolian's confidence and make goalkeeping a crisis area for the last three months of the season. Ricardo's contract was understandably not renewed. Never quite making the cut, Verma returned to Leicester as a trialist in 2008 - he was released as a youth player and carved a career in the non-league before that. Consistently on loan, Verma has made no competitive appearances for the senior team and as such his contract was allowed to lapse and he is once again free to explore the lower leagues. King at least made it into the team under Nigel Pearson when he warmed a seat in a Johnstone's Paint Trophy match against Hartlepool United before replacing Steve Howard in the second half of the following round against Lincoln City. That did not, however, deliver the breakthrough he was looking for and after loans at Hereford United and Northampton Town he has now signed a deal with AFC Telford United. Another youth product to have been released, O'Neill made his début against Hartlepool in that JPT fixture and warmed the bench in the opening game of the following season against Swansea. He played 90 minutes against Macclesfield in the 2-0 League Cup victory before making his first senior league appearance when he came on for an injured Jack Hobbs on Boxing Day. He was loaned-out to Tranmere Rovers in Feburary 2010, joined Kettering on a six-month deal in January 2011 and his contract at the Walkers Stadium lapsed last month. He's now enjoying pre-season training having signed a deal with Mansfield Town. Now at York City where he spent the last season on loan. All youth players who impressed at that level but whose professional contracts ended last month.